Are Dumbbells Better Than Machines? Posted on March 22, 2019 , in Fitness Equipment. We quite often get asked, “Are dumbbells better than machines?” Because there is no straight, simple answer to that question, we’ll typically respond with a question of our own. “What are you trying to accomplish?” When you know what you’re looking to achieve, the differences between dumbbells and exercise machines is a little easier to break down into pros and cons. 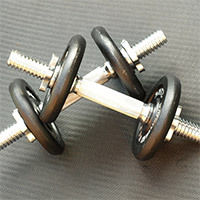 In this article, we’ll go over the benefits and disadvantages of both dumbbells and weight machines so that you’ll hopefully be able to figure out what’s best for yourself. It’s been found that using free weights will activate a larger number of muscle groups at one time than would an exercise machine that focuses on a similar part of the body. Because of this muscle activation, you’ll enjoy more muscle growth with fewer repetitions when using free weights such as dumbbells compared with a machine. With their fixed movements paths, machines have a tendency to focus on fewer muscle groups or even a single set of muscles. The unlimited movement of free weights uses more muscle groups to control the direction of the of the weights while performing the exercise. An example of this is when you use dumbbells for bench presses. Not only are you using your chest and arms to lift the dumbbells, but you’re also using your back, legs, and shoulders to keep the weights steady. When using a machine, you don’t need to use as many body parts to keep everything in line. Another advantage of dumbbells is that they work exactly the same, no matter who manufactured them or in which gym you might find yourself. There may be variations in the way weights are added and removed or in the materials they’re made from, but beyond that, they’re essentially the same thing the world over. Machines, on the other hand, come in a wide variety of types which can differ from manufacturer to manufacturer – even if they’re supposed to execute the same exercise. If you become used to one type of machine and find yourself in a different gym, you may find you’ll need to change your workout routine to accomplish the same goals. If you prefer to do your workouts at home, you can accomplish quite a bit with only a set of dumbbells. Furnishing your home gym with a machine, or range of machines, to create the same workout can cost you quite a bit of money and space. A major benefit of working out on a machine is that you can hone in on specific muscle groups that may be hard to isolate when using dumbbells. Because machines typically don’t utilize the same number of muscle groups that free weight exercises do, you can focus on a particular set of muscles that needs extra attention. Now that you know if dumbbells or a machine may be more beneficial for your home gym, download this month’s promotions to save!